“White box” photography seems to have become quite popular for insects during the past couple of years, and what used to be a rarely used technique for photographing insects has become rather commonplace. It’s really not that hard to do—all you need is a camera, a flash, an insect, and… um, a white box. Put the insect in the box (maybe cover it with a petri dish and turn the lights off for a bit of time until it settles down), direct the flash towards the interior of the box, and start shooting. It takes only a little bit of trial and error to dial in the proper flash direction and duration (or flash exposure compensation if you use ETTL), and the results can be dramatic, especially if you post-process to enhance levels, contrast, brightness, etc. You can even cheat a little and skip the white box if you have a good flash diffuser and don’t care that there might be a little bit of gray in the furthest reaches of the background (pleading guilty here)—just place the bug on white paper and shoot away. I guess I can’t complain about the new-found popularity of “bug-on-white” photography—anything that makes insects more appealing to the general public is a good thing, and the purity of the photos seems not only to enhance the appearance of the insects but actually makes them seem… well, “cleaner.” Nevertheless, I’ve only dabbled in bug-on-white photos and not gotten into the technique in a big way. The reason for this is that I still, all things being equal, prefer to photograph insects in the field in their native habitats—hopefully also exhibiting interesting natural behaviors. That is the goal, of course, but it is not always a possibility, especially when it comes to one of my favorite subject groups—tiger beetles. Photographing tiger beetles in the field is a challenge due to their extremely wary habits, swift running and rapid flight capabilities, and penchant for extreme, often hostile habitats. Many times I am up for the challenge and will spend whatever time it takes and suffer all manner of indignance to get the shot. However, there are times when there are other tasks at hand or a perfect storm of conditions makes the beetles simply impossible to approach. This was one of those times. We encountered the beetle shown in these photos on the California side of Lake Topaz along its muddy southwestern banks. The beetles were not numerous—unusual for the species Cicindela oregona which can oftentimes be quite abundant along shoreline habitats throughout the western U.S. Time was at a premium, as it was supposed to be just a quick stop to see what might be found as we headed further south into Mono Co. to look for some rather spectacular longhorned beetles in the genus Crossidius unique to the area. An added difficulty was the habitat—the beetles were at the edge of a very shallowly pitched mudflat, preventing us from reaching the water’s edge without sinking deeply into the rancid mud. Between this and their scarce numbers, field photographs would have required more of an investment in time and cleanup than I was prepared to spend, so I netted a few individuals for the record and kept one alive for photographs later that night in the comfort of my hotel room. One of the nice things about bug-on-white photographs is the ability to get a variety of carefully executed compositions from the most optimum vantage point. Lateral profile shots are almost a requirement, as are shots with the head of the insect slightly turned towards the lens. Of course, I cannot photograph a tiger beetle and not take the perfectly centered, full-on face shot. In all of these cases, the ability to get the camera truly “down” on the subject’s level means that I can maximize the use of low perspective, and nowadays I don’t even bother with dorsal shots that might be good for some future field guide but that I find really quite boring in their aesthetics. In fact, you can even take the low perspective to the extreme by actually elevating the subject and coaxing it towards the edge of its platform to allow photography from below. Compare the above frontal portrait of the beetle, taken from a particularly extreme low perspective, with the photo above it, taken at the same level as the subject. Both photographs provide an interesting and aesthetically pleasing perspective, but in very different ways despite the small change in the angle of the camera—the upper photo is pleasing due more to the symmetry of the composition, while the lower photo derives its interest in the unusual perspective that highlights the setose mouthparts and bulging eyes. I have long wanted to photograph a tiger beetle with blue sky background (hat tip to Thomas Shahan for giving me that idea during the inaugural BugShot). Sadly, I have not succeeded in doing this. The main problem is in trying to get an extremely wary subject in just the right place at the right time. Since these beetles occur on the ground rather than being elevated on foliage (at least under normal circumstances in the U.S.), one must find a spot where the ground drops sharply enough to allow the photographer to get below the subject, and then somehow get the tiger beetle to pose right at the edge of the precipice. The above photograph is sort of a simulation of the kind of photo I am striving for, achieved in this case by (are you ready for this?) hanging a pair of blue underwear behind the subject, which is sitting on a piece of white paper placed at the edge of the table. The combination of “blue-sky” and bug-on-white techniques is interesting, but don’t think I’ll be able to rest until I have succeeded in a true field version of this photograph. If anyone manages to achieve this before I do, please let me know how you did it (in exchange for me having given you the idea :)). This entry was posted in Cicindelidae, Coleoptera and tagged beetles, California, entomology, insects, nature, photography, techniques, tiger beetles. Bookmark the permalink. Some of the tigers in the jungle do pose on vegetation, but there you have no blue sky! 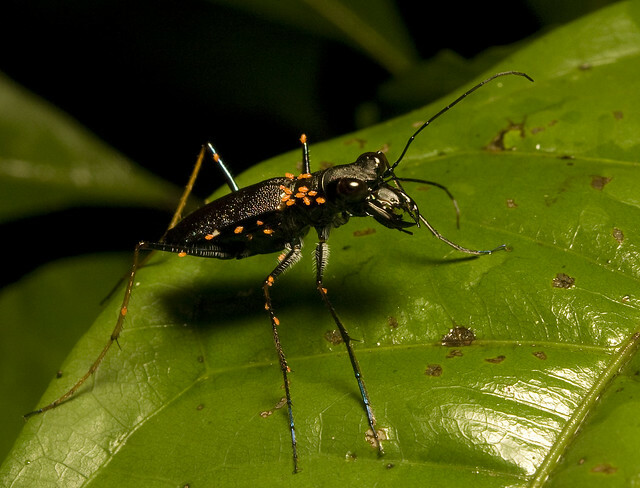 Yes, many tropical tiger beetles are arboreal. It’s not just the tiger beetle and blue sky combination that I’m after, but the tiger beetle sitting on the ground with a blue sky that I really want. “… blue underwear …”! You always inspire me to break out of the mold! I was wondering if anybody would pick up on that!